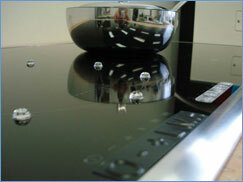 If you are familiar with induction cooking you know it is the safest. Now Diva de Provence has made it even safer for the 10 million blind individuals in North America by offering a tactile marking kit for its line of induction cooktops. The kit includes a choice of either raised letters or Braille symbols, as well as 3M Bumpons™ that can be placed on the controls for easier reading and identification. Since Diva cooktops use electromagnetic energy to heat only the cookware, the cooking/burner surface remains cool* to the touch. *The cook top will only reach a maximum temperature of 482° F (as compared to halogen at 1,112º F). The heat from the pan will transfer to the surface and cause it to be hotter the longer you cook.